Hi all. Happy Monday! It’s zucchini time! Wow, two posts in one day! That doesn’t happen often. But zucchini recipes deserve the spot of second post of the day. A few weeks ago, I became a weekly contributor to Parade’s Community Table. 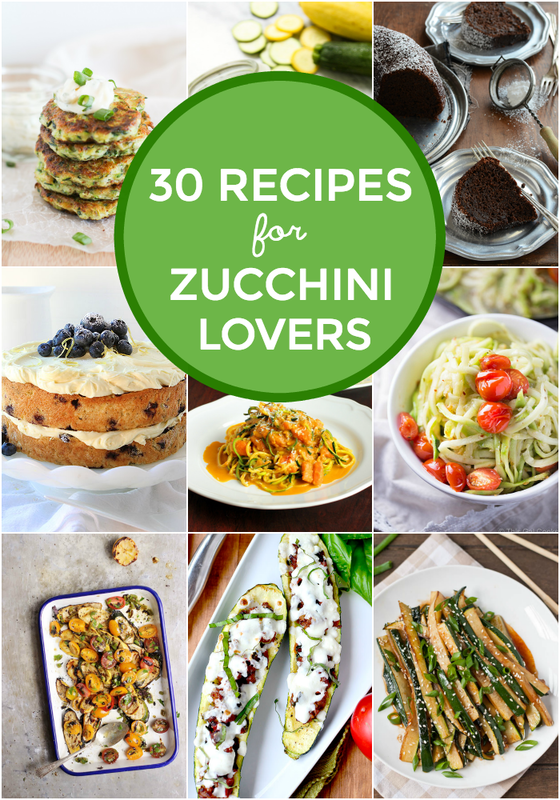 Today I’m sharing 30 Delicious Zucchini Recipes for Zucchini Lovers on their website. If you’re a zucchini lover, you will love this recipe collection. It’s a one stop shop for appetizer, main dish and even a few desserts! In case you missed my other contributions to Community Table, here’s the direct links to the posts. Going forward, I will be posting weekly teaser posts here on This Gal Cooks to direct you to the recipe collection I’m sharing on Community Table. It makes it easier for you to find the posts, right? I hope you enjoy the recipes in those collections. You’re welcome. Malia! I wish I could grow zucchini where I live – our HOA doesn’t allow fruit or veggie plants because they attract critters. Boo! So I have to resort to the market or the grocery store. I always need more ways to use up that zucchini! Fabulous round up!